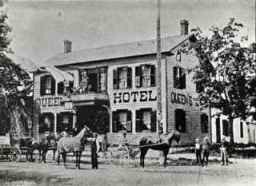 Through good times and hard times, our church survived and prospered and in 1888 the site of a once-notorious tavern (where a live bear was kept chained outside) was purchased by the congregation for our present building. In the 1990s the gift to Rev. Harry McWilliams of a brown stuffed Teddy bear hung on his office door - harkening back to that strange chapter in our history. Known as Potter’s Folly, the home at 241 Trafalgar Road was officially a Presbyterian Church manse for 46 years. Built circa 1870 by shipwright John Potter of Nova Scotia, he died in 1908 without ever having lived in it. An Oakville councillor, Potter also built the Congregational Church and the Oakville Temperance Reformation Society, Potter’s Folly was rented to the Presbyterian Church as a minister’s residence and was bought by the congregation in 1881. 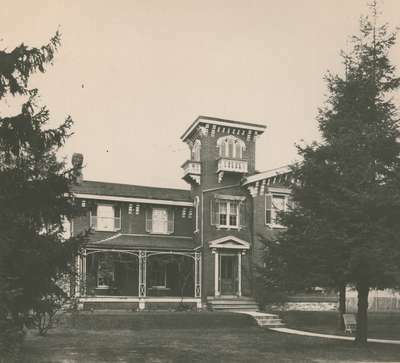 According to the book ‘Old Oakville’ written by Suzanne and David Peacock of our congregation, the house with its distinctive bell tower is the only example of Italianate Villa architecture in Oakville. It was sold by the church in 1927 and the original bell tower balconies visible in this undated photo are now gone. 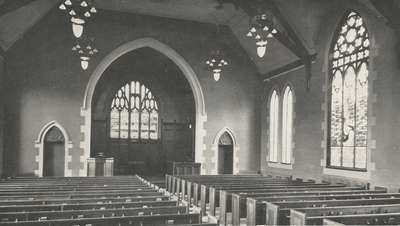 During the 1920s the original sanctuary was renovated and in 1925 Knox voted against joining the newly formed United Church of Canada. The loss of the minister and key members of the congregation to St. John's United Church led to a period of financial difficulty for the church that was weathered significantly by fundraising events held by the women of the church. The changes brought by the arrival of the Ford Motor Co. in the 1950s helped spur the growth of Knox into the vibrant church of today. 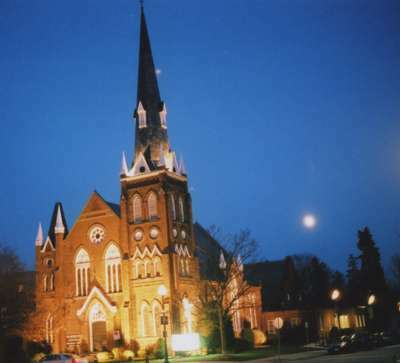 On the stroke of midnight Greenwich Time which ushered in the new millennium, two young members of Knox threw a switch illuminating the outdoor lights of the church, turning the church into a nighttime landmark beacon on the main street. Then on Sunday April 13, 2008, Rev. 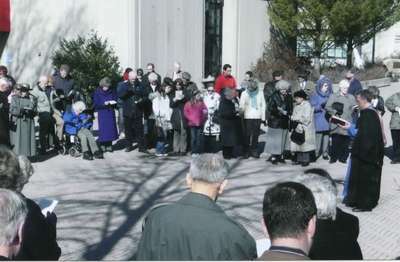 Mike Marsden and members of the congregation gathered in brilliant sunshine outside the Oakville Library to hold a service commemorating that first gathering in a pioneer building that began it all 175 years earlier.